I can’t stop thinking of that interview Marie Forleo did with Brené Brown about her book Braving the Wilderness. 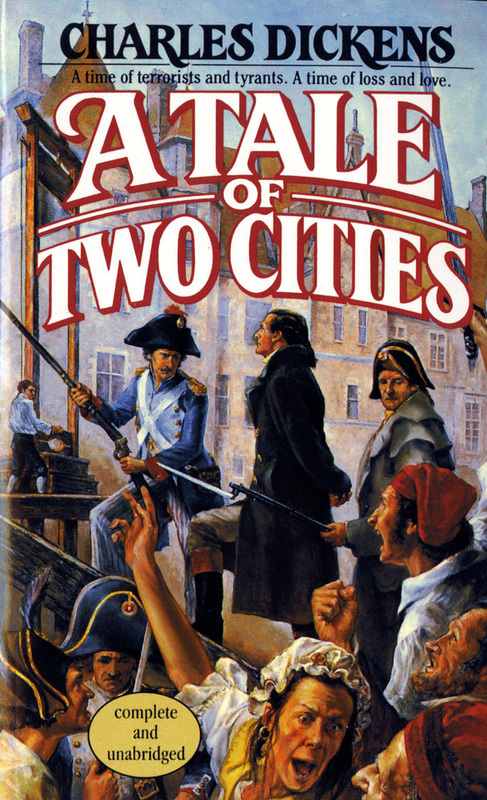 When Brené was talking about the process by which we dehumanize other human beings, I thought of A Tale of Two Cities. There are many examples of how this process happens both in literature and in history, but the thing that Dickens does in his book is to make the process personal and devastating. This story is so timeless that there are four film versions of it. My favorite is the 1938 version with Ronald Coleman, but every version I’ve seen is compelling. The story takes place during the French Revolution. At the beginning of the story, Dr. Manette has been in prison for many years. He was imprisoned by aristocrats because he wouldn’t pledge to keep a secret they wanted buried. Since much of his work was with the poor of Paris, the De Farges, who had worked for Dr. Manette, try to get him released. In fact, that’s how the book begins, with Dr. Manette’s release. His wife and daughter had fled to England when he was taken, and now his grown daughter meets her father for the first time in many years. He’s a broken man. Meanwhile, back in Paris, the De Farge’s are prominent members of the festering discontent that leads to the revolution. A single incident shows the callousness of the French aristocrats and sets the stage for the blood bath that is to follow. The Marquis St. Evrémonde, orders his coachman to speed through the poor part of the city. A child is crushed under the wheels of his carriage and he doesn’t care. Meanwhile St. Evrémonde’s nephew is packing to leave his title and his uncle behind. He can’t stand to see the way the people in his class are so callous toward the poor. And that’s the crux of the story. First the aristocrats devalue the lives of the poor, then the poor, having gained power, do the same to the aristocrats and those who work for them. Many innocent people end up dying at the guillotine. The thing that has stuck with me since I first read the book when I was in high school was how quickly noble causes can be changed to bloody rampages. The De Farge’s have a just cause, but as they gain power they are seduced by blood lust. Their desire to right the wrongs their class has suffered turns against Dr. Manette and his family. Lucy Manette has married Charles Darnay, St. Evrémond’s nephew and the De Farge’s want to kill every last member of the family as if that would bring back the child who got trampled so many years before. It’s shocking how blind the De Farge’s and their cohorts become to the suffering they are causing. My father used to say that wounded people, wound other people thinking it will ease their own pain. Pain, of course, is never eased by harming someone else. The only way to ease our pain is to forgive ourselves and others. Sometimes life throws curve balls at us. Directing this play has been one of those situations for me. I have at times been sucked into the drama of situations with students, but getting upset and angry doesn’t help anything. I’ve had to take a step back and look at why I’ve drawn this into my life. The answer is, I have more guck to clear out so that I can be free of anger and blame. It seems to me that stories like A Tale of Two Cities are examples of how tragic things can become if we fail to heal our own wounds. Trying to control things on the outside never makes us feel better. All the work must be done on the inside, in our own minds and hearts. Thanks for reading, liking and commenting. I hope the rest of your week is lovely.